The thread below concerning Professor Gibbs has been a bit of an eye-opener for me, not least to see experts discussing the Balkans. And I professed no expertise in that area, I followed things about 20 years ago, but not with the detail or intensity of many of my posters. Still, as an antifascist, I can recognise denial when I see it (and I was probably remiss letting some posters contribute to that thread, my mistake), so when I read of Edward S. Herman and Srebrenica Research Group alarm bells started to ring in my head. Initially, I wondered to what extent did Herman denied the genocide at Srebrenica? I assumed it was going to be difficult to find any incriminating statements from him, but I was wrong. Herman despite years as an academic obviously isn’t too concerned with evidence. and Reply To Herman & Peterson. There’s probably more that I missed, but it gives you a flavour of it all. In other schools of genocide denial there are frequently many sleights of hand, misdirections and verbiage, which tend to hide or try to minimise the denier’s outright denial, to soften it, to make it more acceptable. Readers can make their own minds up, but I think when Herman argues a “…third is that the evidence for a massacre, certainly of one in which 8,000 men and boys were executed, has always been problematic, to say the least…”, he is fairly and squarely in the territory of deniers. “By analyzing DNA profiles extracted from bone samples of exhumed mortal remains and matching them to the DNA profiles obtained from blood samples donated by relatives of the missing, the International Commission on Missing Persons (ICMP) has revealed the identity of 6,481 persons missing from the July 1995 fall of Srebrenica. 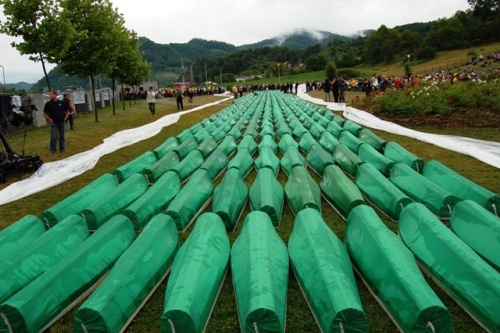 Of this, 775 DNA-identified victims will be buried on July 11th in the Potočari Memorial Center, Srebrenica. The number of reported missing for whom ICMP has blood samples as well as the matching rate between DNA profiles extracted from these bone and blood samples leads ICMP to support an estimate of around 8,100 individuals missing from the fall of Srebrenica in July 1995. In all of Bosnia and Herzegovina (BiH), the ICMP has made a total of 13,124 accurate, DNA-led identifications of individuals since ICMP’s DNA system went online in November 2001. To make these DNA identifications, ICMP has collected 69,838 blood samples from relatives of the victims and has received from BiH institutions 32.295 bone samples taken from exhumed human mortal remains. So coming back to the original point. It didn’t occur to Herman, that perpetrators of genocide often lie and try to hide incriminating evidence of their crimes, even if that is blindingly obvious from past genocides, and bleeding obvious to anyone remotely thoughtful on this subject. So if someone says Edward S. Herman has a point, you’ll know where they are coming from, Genocide Denial and all the baggage that comes with it. Update 1: Bill Weinberg takes Herman and Znet to task in, Z magazine supports genocide. This is a rather good post, Srebrenica deniers get their mucky paws on Rwanda. According to a BBC report, the trial of the war criminal, and one of the parties guilty for organizing the genocide of some 8,000 Bosnian Muslims around Srebrenica in 1995, Radovan Karadzic, has been set for October 2009 at the Hague.